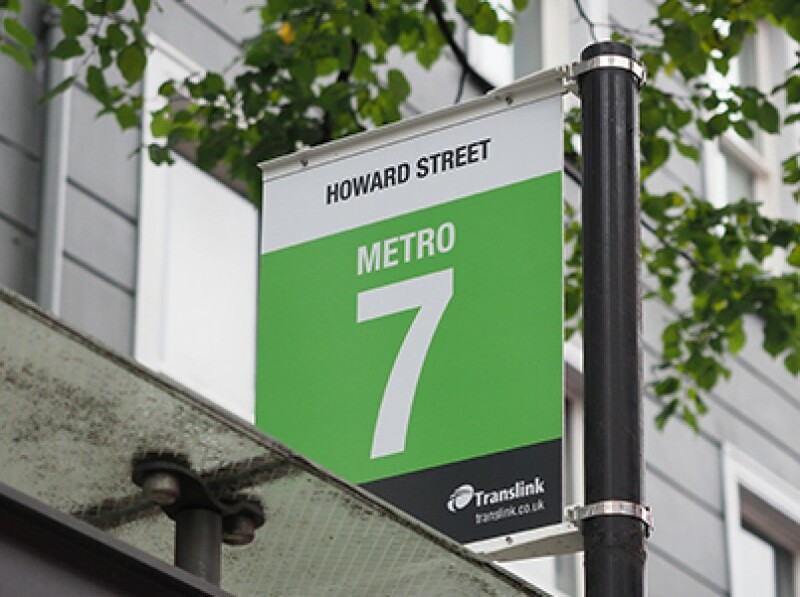 Translink is gliding ahead with a new integrated passenger wayfinding scheme courtesy of Whitenoise. Following on from last Friday's public launch of the new Glider service, today sees the new Glider buses running for fare-paying passengers for the first time. To help service users on their way, Whitenoise was tasked with the development of a radical overhaul of the route and wayfinding information supporting Glider and other Metro services. Comprising new Metro stand signage around the city centre, bus stop flags, a Glider corridor map and branding at the Dundonald Park & Ride terminus, as well as a new Metro map for the city, the work was masterminded throughout by Senior Brand Designer Andy Day with assistance from Mark Case and other Whitenoise team members. A true labour of love, the work was developed from the ground up to provide clarity and ease of use, receiving universal approval from all stakeholders. Scroll below to see a short highlights film, read some user testimonials and see photos of the installed scheme. It's that time of the year again... Say hello to the beautiful new season programme for the Ulster Orchestra.